Learn How to create your own personalized real life pokeball. 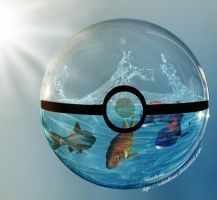 In this tutorial I will teach you how to create the pokeball out of a bubble and water filling. 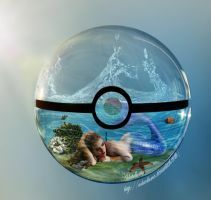 Here is one pokeball image I created previously and I received many petitions to create a tutorial on how to create it. For now I will only teach how to create the bubble pokeball, on my next tutorial I will teach how to create the Pokémon out of one single bubble source as in my latest pokeball creation(the bunny). 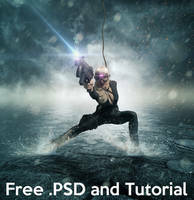 This entire tutorial was created with Photoshop CS5. 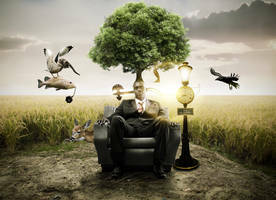 I do not know if all the other Photoshop versions have all the necessary tools to accomplish the tutorial completely. If you liked this tutorial I’m sure you’ll love these other ones I created. gave it a try ! Thank you ! It was great for my first time doing something like this. I used actual pokemon in the ball. Have you made a video for this??? I don't have paint brush 625! Thank you ! I will work more Photoshop ! Hi. How can I get those brushes (sun & watersplash brush)? I'm working with Photoshop CC 2014. The Fish's link isn't working...Just saying! gave it a try. here`s my result.. I made this tuto, and it was really fun! Hello, you give me permission to do a tutorial based on this just in Spanish? I would give credit for the tutorial. I have no clue how to open 2 files in photoshop can you tell me? File > Open for the first one. Then File > Place to put the second one in the first one. Or just drag the first one over PS and drag the second one over the first one once it's open. Nice job on the tutorial . Nice tut, kie. really learned hw to do it. btw, u got any links to sun brush and water brush? Can you make Fire inside the Pokeball?